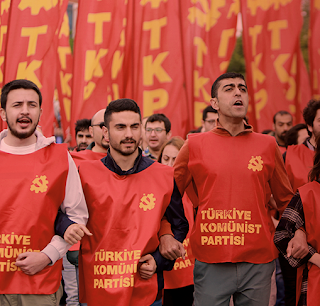 According to soL international, members of the Communist Youth of Turkey (TKG) were attacked by fascist mobs on February 22 during their campaign against imperialism and the NATO at the university campuses in Tekirdağ and Antalya provinces of Turkey. In Tekirdağ province, a black car approached TKG members, asking for a leaflet menacingly. As the fascists started gathering in front of TKG members, they threatened the communists to terminate leaflet distribution. They attacked TKG members with fists and iron rods, injuring the head of two. The students were interrogated by the police before they went to the hospital for medical examination. When the police learned that TKG members will press charges against the fascists, the police investigated for hours to find an element of crime in the leaflets against imperialism and the NATO. In Antalya province, the fascist mob that attacked TKG members tried to examine the handbags of the communist youth, threatening that they are going to "take them into custody." A brawl occurred between the fascists and the communist youth, causing minor injuries. TKG released a statement in response to the fascist attacks at the universities, saying that the anti-imperialist campaign of the communist youth throughout the country has irritated the anti-people mob on top of the state. The statement noted that the fascists assume the role of a watchdog of NATO. "The history of the fascist groups and followers of sharia that attack the youth distributing leaflets saying 'NATO is the greatest terrorist organisation' is also the history of collaborationism and pro-US stance," said the statement. The statement added that such pseudo-patriots did not even question the NATO bases in Turkey, and yet brutally attacked the true patriots in 1969, stabbing a student and two workers to death. Although some of the fascist figures who took part in this attack that is remembered as the "Bloody Sunday" later said that they were regretful and confessed being "manipulated by the US", it would be useless for them to hide behind pseudo-regretfulness in the future, said the statement. "In contrast to the communists, they know better to serve for the Yankee rather than the anti-imperialist struggle they announce at the parliament", the statement said, adding that these people are "terrified of the demands of the true anti-imperialists" that the NATO bases should be closed and economic, military and political bonds with should be broken. The statement noted that the anti-imperialist struggle will be escalated both in Tekirdağ and Antalya provinces where the fascist attacks happened, adding that "the real respondent and enemy of the communist youth is the capitalist class which holds the leash of these mobs."